ExtrabiomesXL 3.15.2 – Happy Chocolate Day! So here we are again. The 3.15.2 patch is actually pretty big – and while we were feature complete on Tuesday, the team has spent the last few days hunting down some bugs. We hope you like it. And by it, I mean chocolate covered strawberries. It has long been one of my biggest complaints with vanilla MC that they never really make good use of the materials they provide you with. I mean, take pumpkins for example. They have have been around since alpha but have only been edible since 1.4. EbXL 3.15.2 introduces farmable strawberries. You can find them growing wild in a variety of places. The bushes regrow, so you only need to plant them once and then punch them when they’re ready to harvest. By themselves, strawberries aren’t terribly valuable as food. But because of the effort involved in producing it, chocolate is a bit more filling. And chocolate covered strawberries are more valuable than their individual ingredients would be if eaten separately. These strawberries are the first of what will be many interesting crops that we plan to introduce, and are really meant as a test of the crop system. EbXL 3.16 will flesh out the system with more types of crops and recipes from them. 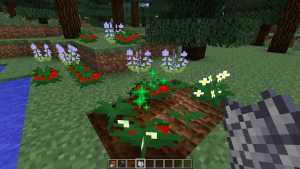 We will, however, try not to be overwhelming with it – and are thinking about making an optional addon that contains additional crops and recipes for those who really like that sort of thing. 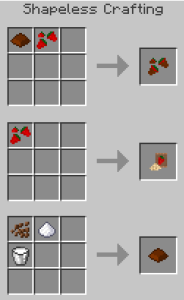 Bone meal super powers activate! In addition to crops, we’re also adding two new classes of plant to EbXL. 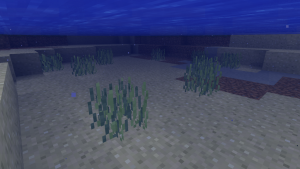 Namely – underwater and vine plants. Expect to see more interesting varieties of these in the future. 🙂 We’ve also added another regular flower that turns into cyan dye and have added custom dyes to provide colors that vanilla reuses for other purposes – which means we produce all dye colors except grey and dark grey. Gloriosa flowers grow like vines. Added delphinium belladonna and blue poppies. Added new dyes for white, black, brown, and blue. Updated some flowers to now produce these dyes. 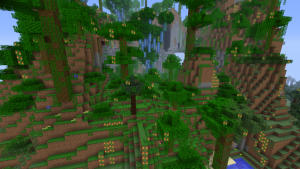 Added configuration settings to control the density of new flowers in each biome. Added strawberries, chocolate, and chocolate covered strawberries. Improved ability of flowers to spawn in snowy biomes. Removed toadstools from snowy biomes. Fixed some plants that were unintentionally changing colors to match their biome. Fixed the “already decorating” errors sometimes encountered when generating large trees.